Che Eyewear brings to you an exciting, unique range of eyewear, including the largest collection of Authentic Vintage Eyewear from (circa) 1940’s, 50’s and 60’s, to be found in Melbourne. 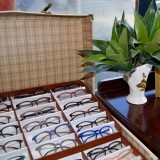 Our extensive range of prescription frames and sunglasses. Che Eyewear brings to you an exciting, Unique range of eyewear. Including the largest collection of Authentic Vintage Eyewear from (circa) 1940’s, 50’s, 60’s, 70’s and 80’s to be found in Melbourne. We provide a complete dispensing service which includes frame repairs and adjustments and are able to process claims directly from all private health funds.